Posted by Jon in Mezco, One:12, Toy Fair 2018 with 0 comments. Good old Mezco, even when I think I have you figured out you still manage to surprise me. This year, Toy Fair was no exception. Mezco brought a whole mess of surprises for fans of their One:12 Collective line. Not just Marvel and DC, but even more horror and movies. On top of that we also were given a lot of dates, so I think that they are beginning to catch up on their backlog of reveals and preorders will begin to hit hard. This could prove to bring us a very fulfilling and expensive year! Let’s dive right in to what Mezco had to show at Toy Fair! On the Marvel side of things, we got quite a few nice surprises. Being a huge X-Men fan, Cable and Cyclops are quite welcome. What we didn’t get to see pm the show floor, however, are all of the neat blast effects Cyclops comes with. I actually wasn’t sure if I was totally on board with Cyclops at first, but once I read their catalog after wards I was all in. 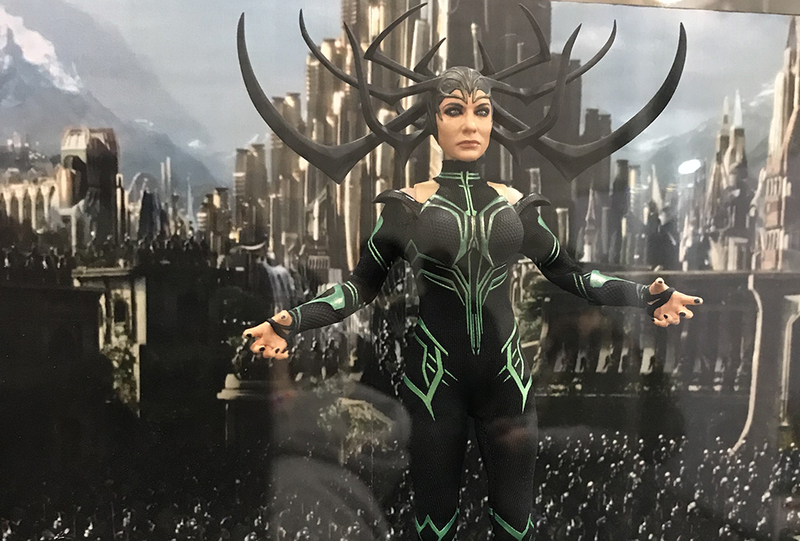 Another nice reveal was Hela from ‘Thor: Ragnarok.’ With the movie cycle already moving on I was kind of expecting to maybe see something from Infinity War, but Hela was a nice surprise. And from what I was told she’s a very early prototype and already looks stunning! Moving along to the Netflix side we get Daredevil’s original costume and Punisher. Oh, and I almost forgot Blade! I believe he’s the comic version even if he really does resemble Wesley Snipes are certain angles and levels of my own inebriation. For DC, we get our first look at the comic version of John Stewart Green Lantern. Is there a TV or movie version? Well this isn’t that so no need to worry about it. The entire Justice League Movie cast was present: Superman, Wonder Woman, Batman, Aquaman, and The Flash. I’d like to say this is the first time we’ve see movie Flash, but don’t quote me on that. With the horror genre we will be getting a Jason and Michael Myers. The Living Dead film zombies are coming as well as Ash Williams. Finally, my dream figure, John Wick. He’s coming in 2019 and I can’t wait. Check out the gallery of pictures below from their booth at Toy Fair 2018. And thanks again Mezco for putting on a hell of a show. I look forward to San Diego Comic Con. Big thanks to Matt over at AwesomeToyBlog who came to the rescue with some pictures when my memory card failed!